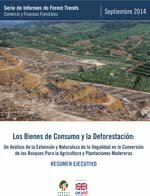 Exports from Illegal Conversion Worth US$61 Billion and Responsible for 25 Percent of Tropical Deforestation; Brazil and Indonesia’s Illegal Land Clearance Highest in the World. WASHINGTON, DC | 11 September 2014 — A comprehensive new analysis released today says that nearly half (49%) of all recent tropical deforestation is the result of illegal clearing for commercial agriculture. 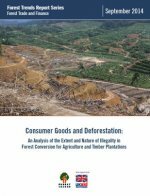 The study also finds that around half of this illegal destruction was driven by overseas demand for agricultural commodities including palm oil, beef, soy, and wood products. In addition to devastating impacts on forest-dependent people and biodiversity, the illegal conversion of tropical forests for commercial agriculture is estimated to produce 1.47 gigatonnes of carbon each year—equivalent to 25% of the EU’s annual fossil fuel-based emissions. 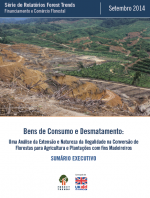 According to the study, Consumer Goods and Deforestation: An Analysis of the Extent and Nature of Illegality in Forest Conversion for Agriculture and Timber Plantations, 90% of the deforestation in Brazil from 2000 to 2012 was illegal, primarily due to the failure to conserve a percentage of natural forests in large-scale cattle and soy plantations, as required by Brazilian law. (Much of this occurred prior to 2004, when the Brazilian government took steps to successfully reduce deforestation.) And in the forests of Indonesia, 80% of deforestation was illegal—mostly for large-scale plantations producing palm oil and timber, 75% of which is exported. While other countries also experience high levels of illegal deforestation, Brazil and Indonesia produce the highest level of agricultural commodities destined for global markets, many of which wind up in cosmetics or household goods (palm oil), animal feed (soy), and packaging (wood products). Note: Mid-point estimates based on sensitivity analyses conducted for this report.